While Paris has her cultured beauty and sophistication, I’d appreciated the change of scenery and warmer weather as I headed south to Provence. Three hours via the TGV took us to the historic City of Avignon, site of the Papal Palace before the Vatican. 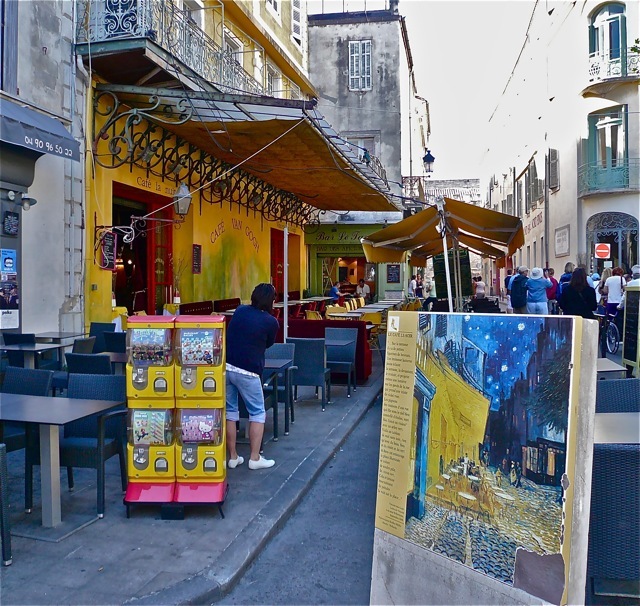 We stayed in Avignon for three days, taking daily excursions out to nearby towns. 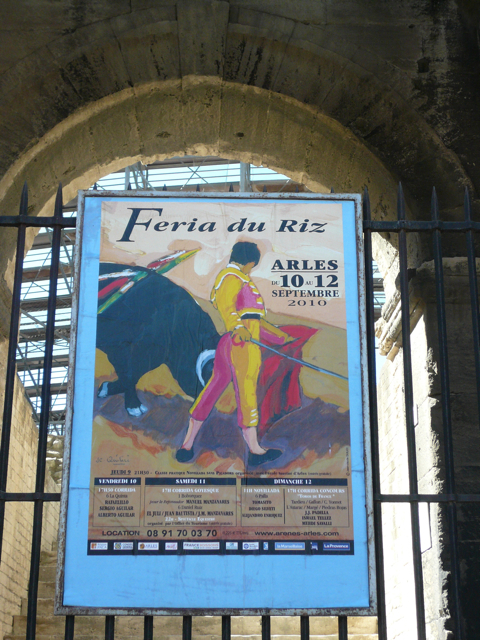 Arles was a must-see on my list. It seems to me almost impossible to be able to work in Paris, unless you have a refuge in which to recover and regain your peace of mind and self-composure. Without that, you’d be bound to get utterly numbed.” — Tuesday, Feb. 21, 1888. The fresher and more colourful palette is apparent during this most prolific period of the artist’s life. 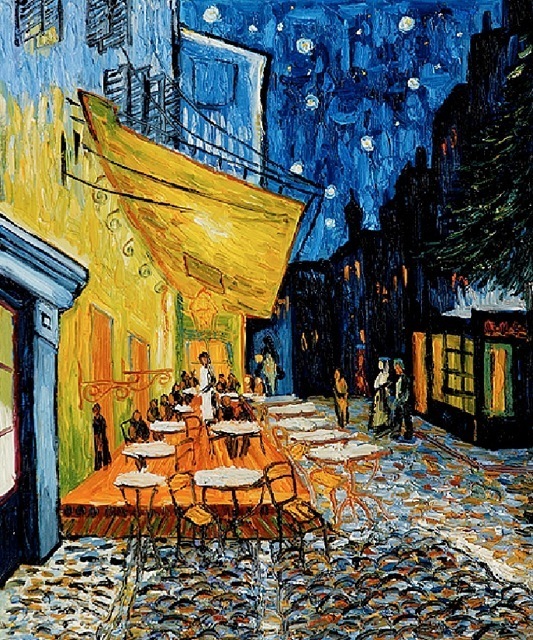 Bright yellows, blues, shorter and swirling brush strokes established his signature style. As for me, I was a bit disappointed to see the sunflowers have already withered in late August. Fields of yellow were now massive brown. They would be harvested at a later time for their oil, a good reminder that, for tourists, it’s the view, but for those living here, it’s their livelihood. The lavenders on the Luberon mountains too had long passed the season. Note to myself: Early to Mid July is best if I ever come this way again. But all was not lost. 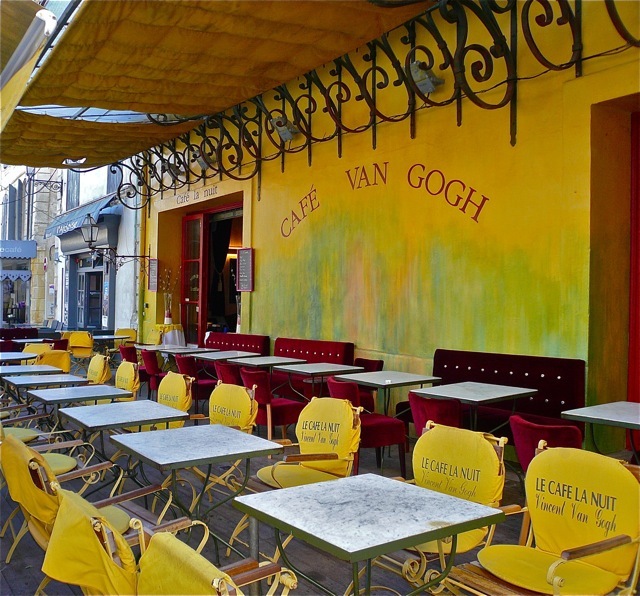 I was gratified to follow some of Van Gogh’s footsteps as I explored the clearly posted Van Gogh sites in the town, the scenes and locales where the artist so vividly captured in his paintings. Arles is a Roman town. 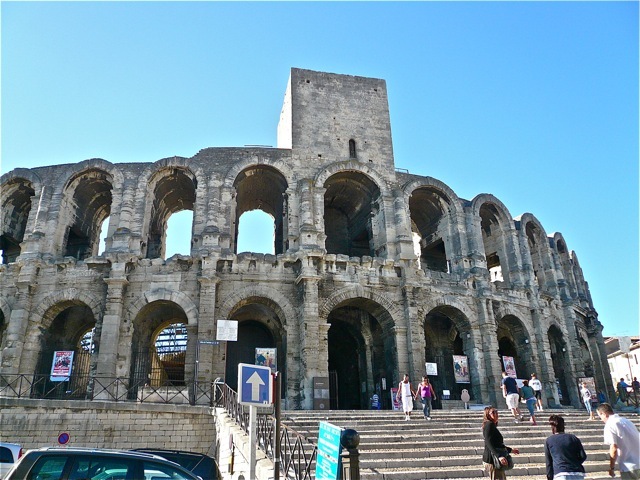 What more prominent to reflect its past glory than the Roman Arena in the town centre. Why all the arches? The free flow of pedestrian traffic. The full seating capacity, 20,000 people, could exit the Arena in 7 minutes. 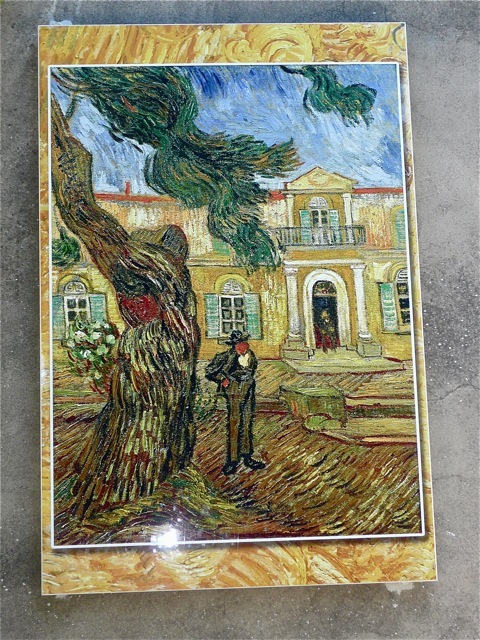 At 11:30 pm., Vincent Vaugogh [sic], painter from Holland, appeared at the brothel at no. 1, asked for Rachel, and gave her his cut-off earlobe, saying, ‘Treasure this precious object.’ Then he vanished. — Sunday, April 21, 1889. 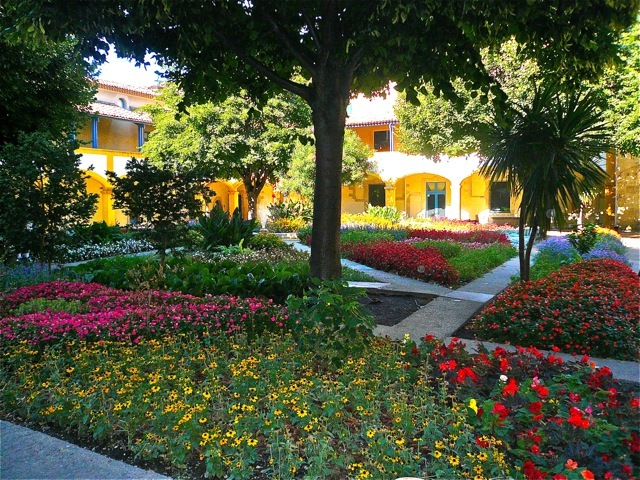 On May 8, 1889, he checked himself into the Saint Paul de Mausole, the mental hospital at St-Rémy-de-Provence. 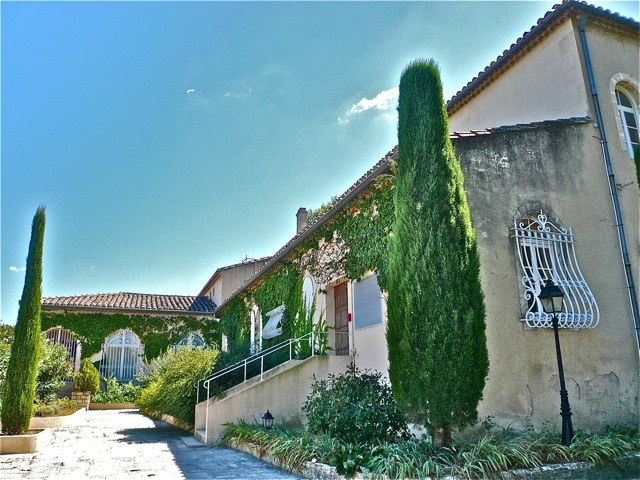 Under the care of his doctor Théophile Peyron, the artist’s condition improved and he thrived in the idyllic environment there. Art therapy had brought healing and prolific output. 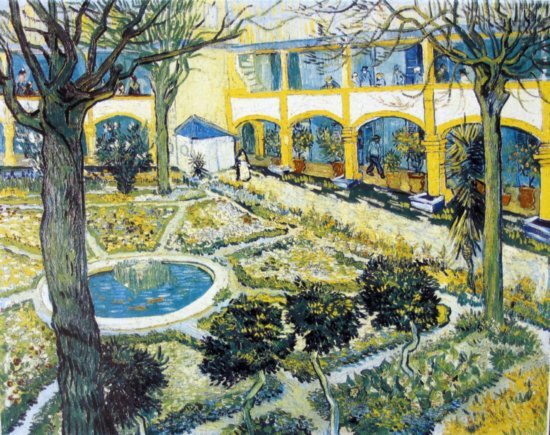 Van Gogh stayed there for a year and created more than 150 paintings. My Van Gogh trip ended at St. Rémy, and so be it. I’ve seen the sites wherein the artist was at his most prolific. I’ve seen the town and surroundings where he found inspiration. I’ve seen his final solace where he attained some stability and painted with passion. I’d like to keep these as memories of my travel to Provence. I could hardly bear to think of his last days, discharged from St. Rémy just a few days after the above letter, headed north to Auvers-sur-Oise on the outskirt of Paris, and in just two short months, succumbed to the recurrence of his illness. He shot himself in the chest with a revolver on July 27, 1890, and died of his wound two days later. Back to the thoughts I wrote about in my last post: How do we keep art from turning into a cliché? I think it takes a certain awareness of the artist as a person, plus a measure of empathy and respect for the struggle to live and create… and realizing that the beautiful works are often triumphs in spite of life’s overwhelming adversities, rather than the natural products of bliss and fortune. An excellent and comprehensive site for Van Gogh’s letters, 900 of them, poignant account of his life. Rick Steves’ Provence and French Riviera 2010, published by Avalon Travel, p. 69. I really enjoyed this post and wish I could be there. I never left Paris when I visited France many years ago. It is easy to see where the cliché of the tortured genius comes from. Thank you for giving the story some visual and geographical context. Your photos are excellent! 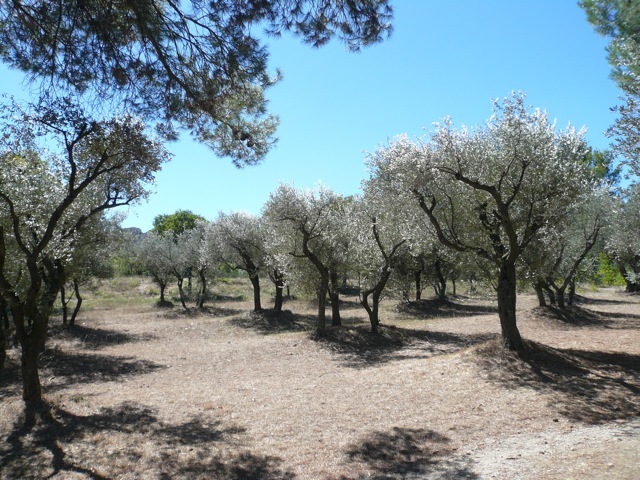 Provence is a place I’d love to revisit. I’d like to know more about VG. His letters are a valuable resource to know the person, a way to avoid clichés. Thanks for your kind words. Enjoyed your musings on the tipping point between High Art and cliche. No easy answers, are there? She’s been on the covers of Mad and The New Yorker, yet the Mona Lisa still compels. In the Louvre four years ago, I took photos of the crowds surrounding her, winged Victory, and the Venus de Milo, feeling a bit sorry for them. Every gallery we entered was crowded. And then i looked up–and there was a Matisse (or Matisse-like) dove on the ceiling! And no one noticed. Amazing! So you have brought hefty philosophical thought to this muddled head. Thank you for your most informative and insightful “travelogue” with its beautiful photographs. Well done! Oh thank you so much for reading through them all… it’s quite a chore isn’t it. 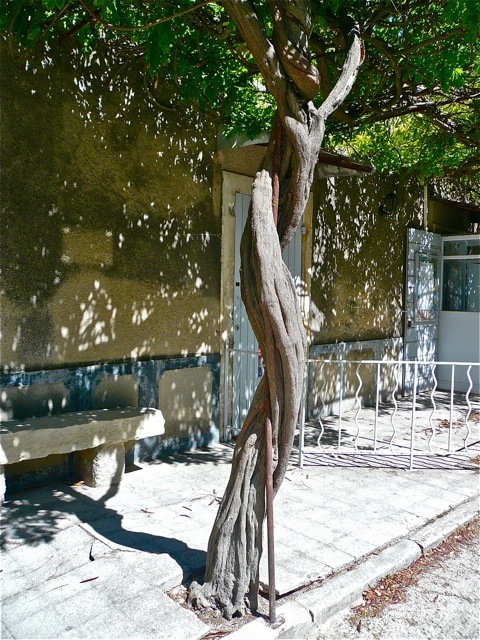 I’d never thought I’d write five posts just on my travels, but you know, there are many more photos and stories I’d like to share, especially of other fantastic places in Provence. However, I’ll have to do that some time in the future, because I’m so behind with my movie reviews. I’ve committed to the ‘Read the Book, See the Movie’ Challenge over at Ready When You Are, CB, upon your recommendation… thanks 🙂 I mean it well because that’s really my cup of tea… That’s the reason why I started Ripple Effects. But I hardly have time to do that, and for some movies I’m still waiting for them to screen here in my City. And then there’s the Calgary International Film Festival this week, I’ve been so busy just watching movies, no time to write about them. Just got one up. Again, thanks for stopping by and reading through my ‘travelogue’, and leaving your kind comment! I really love this post, Arti (and DS’s comment too, wow). I love that you showed the scenes from his paintings. I was fascinated about his long stay in the hospital and prolific period of painting. I really should read his biography (or watch the film about him). I couldn’t agree more about the clichés of art and culture. I feel that way when I go to Paris and stand on the pont Neuf, the most beautiful bridge in the city. There is a reason it is a cliché. It is an icon, a magnet. But that does not diminish the facts of its beauty. 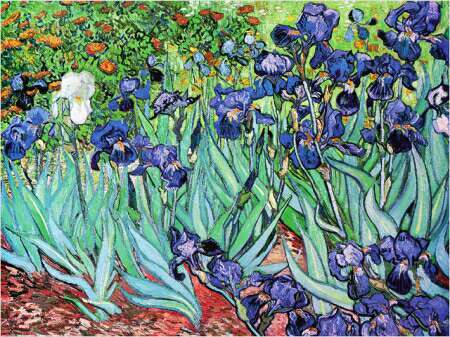 Van Gogh’s story is so compelling and his art so authentic and beautiful that we humans keep swarming to it like bees. But our buzz is a symptom of its beauty. We do need to keep reminding ourselves of what created it, who created it. I have been ruminating on this very thing, strangely and synchronicitously enough (is that a word?). Just yesterday I had posted the fourth and final poem of a Rumi series at my RUMI DAYS blog, with which I had paired Van Gogh paintings for some reason (decided after the first to continue through the 4 sections of the poem). The last is his self portrait with his bandaged ear, and smoking a pipe. After posting that and getting ready for work, I started to leave and decided to grab a CD from the shelf for my ride to work, something I never do, since I have a stash in my car already. Guess what I grabbed? It was Joni Mitchell’s Turbulent Indigo, the cover of which is her self portrait copying this very Van Gogh self portrait (she is an accomplished painter, you probably know). The song Turbulent Indigo is speaking to those who think they can paint like Van Gogh, without having lived the pain he lived, the turbulent indigo. Thank you for adding to the swirling conversation in my head, which is probably leading to a post. As for Joni Mitchell… of course, she had attended the Alberta College of Art and Design right here in Calgary! And she had said: “I’m a painter first, and a musician second…” Anyway, thanks for introducing me to the song Turbulent Indigo… the lyrics are apt commentary on the issue of Art and Cliché, oh what sync! If you know a person well, empathize with his torments, you wouldn’t make light of his struggles and his portrayal of himself. Again Ruth, read his letters, a moving experience awaits you. 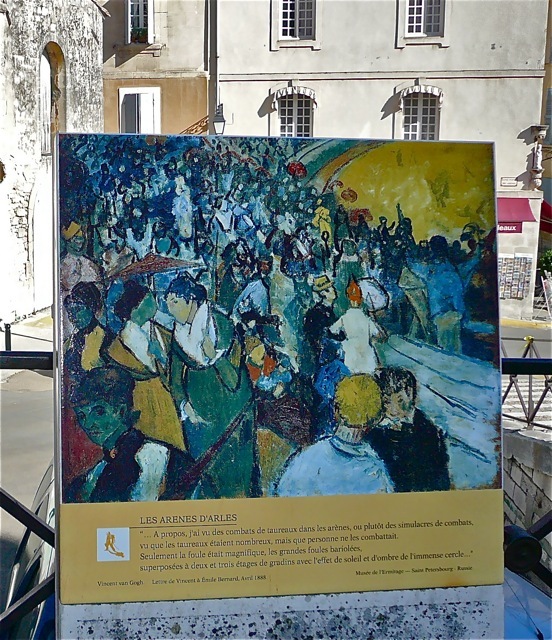 Van Gogh’s work in Arles never fails to inspire me. I love the Cafe, and used that in a post some time ago – it pleases me that now and then someone clicks in from a google search for either the artist or the work. One of the real treasures I found online while writing that post was a pen and ink study for a “starry night” canvas. It’s such a different experience to see it done in a different medium. It seems to me that’s one of the best ways to avoid the seeing-that’s-not-seeing when it comes to famous art – getting a sense of the process, as well as the final product. You are indeed encouraging… but until my film script is in production I’ll be blogging and blogging still after that. I have a feeling that will be a long time coming, way after I see your book in the stores. That is an interesting rendering of Starry Night. 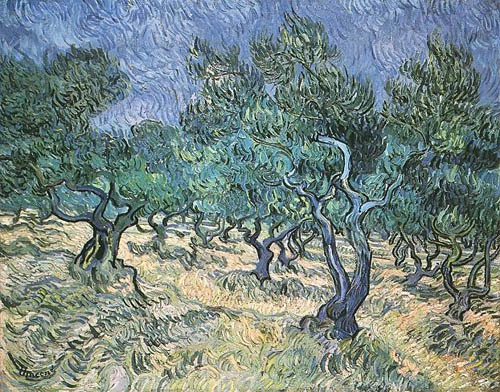 As a matter of fact, VG sometimes painted certain subjects several times, like he had different versions of irises, olive groves, or starry nights. While actually visiting the sites was memorable, I found reading his letters is even more revealing… as it should be, since I can tap into his thoughts and feelings. If you have time, do click on the link at the end of my post to read his letters… some with sketches on the side. I’m sure you’ll enjoy them. You have no idea how thrilled I am that you joined C.B.’s Challenge! He’s a great person as well as an interesting blogger (he’s an awesome teacher–and he makes books of his own; very creative). Just read your latest movie review–I love Jim Broadbent. You must be quite pleasantly exhausted from the film festival! Thanks for sharing your own Arles experience 😉 Maybe you’d want to go there again another time… I would love to revisit Provence, any time. And, I must get hold of that book… thanks for letting me know. Love your posts and information…listening to “Turbulent Indigo” right now… My son Vincent and I shared a passion for Van Gogh’s work, and often I would refer to a painting as “Starry, Starry Night” he would correct me and say, “That’s the song, Mom, the painting is just “Starry Night.” My son Vincent took his own life in November, 2010, at age 30. I have no words to respond to your most tragic and devastating loss. I only hope that in your own way, you have found peace and solace as time passes by… ever so slowly. About three years ago, after posting C.S. Lewis’s book A Grief Observed, I received an email from a reader feeling that could help a friend of hers dealing with the loss of a son. Here is the post. I’m moved to see you’ve put forth such an amount of trust in sharing here. I thank you deeply.